The KQED Book Nook is tucked away on the third floor of the KQED building in the Mission District of San Francisco. It's the perfect place to talk to authors about their new work, their lives and more. 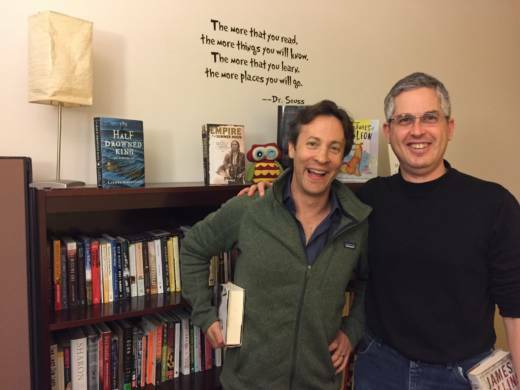 David Eagleman and Anthony Brandt are the co-authors of "The Runaway Species: How Human Creativity Remakes the World." Eagleman is a neuroscientist, Stanford professor, and host of the PBS show "The Brain." Brandt is a composer and professor at Rice University in Houston. If you had to describe your book in 10 words or fewer, how would you describe it? Anthony Brandt: Creativity is part of every human brain. We need to cultivate it. What is the question that you're tired of being asked about the book? Brandt: I don't know that we're tired of it, but there's a lot of curiosity about AI (artificial intelligence) and whether it's going to be looking over our shoulder creatively anytime soon. Eagleman: We've been asked a lot whether creativity also has a negative side which it definitely does for humans, but I think we both clearly feel that the positive sides of creativity have completely overwhelmed the negative sides in the sense that we have as a species risen up from all the other species, and we're doing incredible things like getting to the moon or creating the Internet and curing cancer and figuring out our genomes and so on. And as far as we can tell none of our animal cousins are doing this. What is the question about the book you wish someone would ask? Brandt: One of our driving forces in the book was to argue for more arts and creativity in the schools, and I don't think we can get asked that question enough because it's so important to both of us. We need to take a hard look at the way we're educating our kids and have a real remodeling of the strategies and the approaches and what we're doing. Eagleman: Creativity is taking in the world and remixing it to bring out new versions of it. The piece of it also that's often under appreciated is the filtering piece which is to say we come up with lots of novel worlds every moment of our lives and most of them don't make sense in some way and they don't stick. And so we filter those out. But that's what creativity is about. Brandt: It's a tension between the familiar and the novel and trying to find the sweet spot in between them. Who is the most creative person around right now? Eagleman: I think we would strongly answer that that is impossible to know, and the reason is that creativity is always judged in retrospect. All throughout history there have been people who come up with big ideas that are totally not appreciated in their time and they only emerge later as having been really creative geniuses. By the same token there are people who are appreciated in their lifetimes doing something really wonderful and then later it's seen that it's sort of trite and they don't stick around and everywhere in between that. So challenge is that it's just really hard to tell what qualifies as creative because sometimes that takes a lot of time to figure out. Brandt: And that's a reminder of how we can't prejudge children either, and we have to be very careful. The very idea that we could pick out the most creative person often gives us the illusion that we can then identify in children who are the most promising. Society is too fickle and it's too often wrong. You have to give everyone a chance and see where it leads. What's the most creative thing that you have done so far in your life? Eagleman: So I'm a neuroscientist, but I wrote a book of 40 short stories called "Sum," and that's been such a lovely part of my life because it really took off. I'm happy to say it became an international bestseller. It's in 32 languages now. It was turned into two operas by Brian Eno at the Sydney Opera House and by Max Richter at the Royal Opera House in London, and that's been a very special part of my life. Brandt: I'd say my chamber opera "Ulysses Home" which is about a soldier coming home with post-traumatic stress disorder. Writing something that so clearly connected with the community but being able to do it in a avant garde musical way was really very satisfying. What is the place that gives you the most inspiration? Eagleman: I go to IHOP, and the reason is I can get a lot of work done when I sit down at IHOP. I spend most of my time digesting the world whether that's at my startup company or on the Stanford campus or reading, you know taking things in. What you actually need to have creative output is also time to digest the world, and so personally I'm going to I hope I always have for my whole writing career. It's because it's just just the right level of boring there as opposed to something like Starbucks which is really interesting if you look at all the attractive people coming in and out. IHOP is really boring, and I can sit there with bottomless coffee and really get stuff done. Brandt: I think a great concert because of one of the things that you know I feel very strongly is that a great piece of music is actually acting out the creative process right in front of you in real time so you can experience it. You start from some starting point and then you hear a composer like Beethoven working through the ideas in that sweet spot between novelty and familiarity. You know where they're coming from but you don't see where they're going. I just love sitting through that as a way of generating my own thoughts. What is the best science book for a non-science person? Eagleman: I really enjoyed Jeff Hawkins book called "On Intelligence." What is the best music book for a non-music person? Brandt: It wouldn't be a book. It would be a piece. I'll say Beethoven's Ninth Symphony. What's on your to-read list right now? Eagleman: Well I got halfway done with E.O. Wilson's "The Meaning of Human Existence," but then I had to return it to the library because of the due date so I'm looking forward to finishing that. I also just got "The Three-Body Problem," which is a science fiction book. I never read science fiction but this seems very interesting. Brandt: David has highly recommended the book "Sapiens," so I'm interested in reading that.